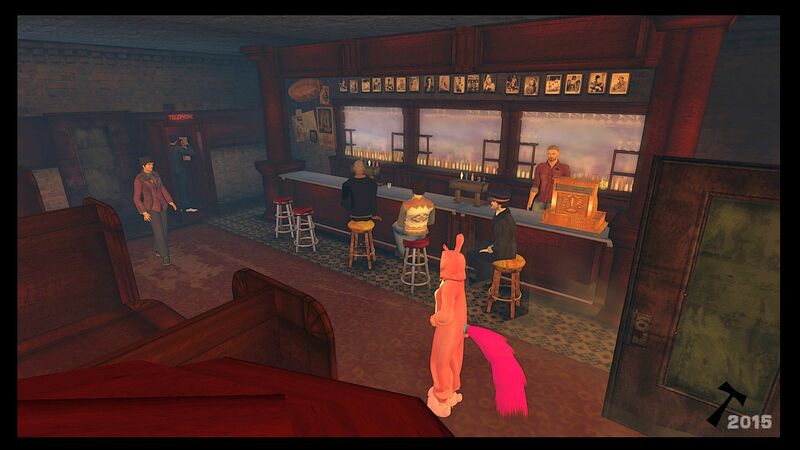 Second Life Scrapbook: Discovering Innsmouth(once more). That is what I gather from the save Innsmouth tip-jars in Second Life. Innsmouth is a place in Second Life that is named after the place of the same name from the novella ‘The shadow over Innsmouth’ by H. P. Lovecraft, and it promotes the works of Lovecraft and offers a place for people who like to role-play in the world of Lovecraft. This world of Lovecraft is maybe better known as the world of the Cthulhu mythos. I specifically mention this because this world includes more writers than Lovecraft such as Clark Ashton Smith(one of my favorites) You could say that Lovecraft was the one who laid the foundation and because he corresponded with a lot of other writers he influenced others and others of course influenced him. One such writer is the writer of Conan the barbarian, Robert E. Howard. Another such writer was August Deleth who founded the publishing house Arkham House, a publisher specializing in printing works of weird fiction, such as that from Lovecraft.Lovecraft’s world actually inspired a lot of other people who made movies(The Dunwhich horror, Dagon, the call of Cthulhu), board games(Arkham Horror, Elder Sign), video games(Alone in the dark and lots more) and even art( through the iconic Necronomicon: see Giger’s Necronomicon. Which in itself influenced the movie Alien. Can it be said that Lovecraft indirectly influenced the movie Alien? Perhaps it can :P). I thought to make a few pictures there as kind of exercise but perhaps also as a kind of memorial.